There's a debate raging about the impact self-published ebooks will have on the book publishing business. By my estimates, self-published ebooks will account for 50 percent of ebook sales by 2020. On one side of the debate, you have people such as myself who believe all signs point toward indie ebook authors capturing an ever-greater percentage of the book market. Could both sides be correct? Yes, if you look at the numbers as they stand today and no if you look at the trends. When we examine the trends and the drivers of these trends, a new picture emerges. Print will decline as a book-reading format -- More readers will continue transitioning from print to screens. The transition to screens will be driven by the low prices, selection, exceptional discoverability and instant reading pleasure delivered by ebooks. Brick and mortar bookstores are disappearing -- Physical bookstores will continue their march into the sunset with more store closures in the years ahead. I'm not happy about this, but I don't see the trend reversing unless bookstores start serving wine and pot brownies in their cafes. The perceived value of publishers will decline in the eyes of writers -- As the importance of print distribution declines, the importance of publishers will decline. Prior to the rise of ebooks, publishing was a print-centric game. Publishers controlled the printing press and the all-important access to retail stores. Print distribution remains an important glue that holds many writers to their traditional publishers. When publisher stickiness decreases, writers will be tempted to explore the indie author camp. Indie authors have learned to publish like professionals -- The professionalism and sophistication of indie authors has increased dramatically in the six years since I launched my company Smashwords. This means self publishing will lead to the publication of more better books, and more diversity of better books. The innovation taking place today among indie authors is amazing. This innovation and professionalism will continue in the future as indies pioneer and promulgate tomorrow's best practices. These authors are publishing books that are quality-competitive with traditionally published books, but priced dramatically lower. As a result, these authors have the ability to under-price, outsell and out-compete the ebooks from traditional publishers. It means indie authors will have the ability to serve and please readers more effectively than traditional publishers. The stigma once associated with self publishing is disappearing -- Indie authors are in the cool kids club now. They're earning and deserving the respect of readers. At the same time the stigma of self publishing is melting away, the stigma of traditional publishing is on the rise in the minds of writers. Writers know they can self publish with pride and professionalism, and they're developing Teflon skin that deflects the once ego-bruising criticism levied by self publishing naysayers. If you haven't been to a writers conference lately, go to one. Five years ago, it was common for writers to leave conferences depressed and browbeaten in the knowledge that their dream agent only accepts one in 10,000 queries. Today, writers attend conferences and learn to self publish like a pro. They leave the conference upbeat with the confidence that one way or another, their book will see the light of day. The number of self-published ebooks will explode -- As self publishing gains credibility, more first-time authors are embracing it as their option of first choice. They're using free ebook publishing and distribution platforms to achieve global online retail distribution (every major ebook store wants to carry self-published ebooks). Every publisher -- even indie authors -- will face increased competition from the glut of high quality works that never go out of print. Successful indies are mentoring the next generator of writers -- New indie author heroes are minted every month as indie authors scale all the bestseller lists. These authors are mentoring the next generation of authors and sharing their secrets to success. Indie authors comprise a vast publishing collective of writers helping writers. Writers are discovering the joy of self publishing -- If publishers are from Mars, authors are from Venus. They speak different languages and hold different values. The rewards of self publishing transcend the conventional and myopic commercial-metric value systems of publishers. Indie authors are enjoying total creative control, faster time to market, ownership over their publishing future, and the flexibility to innovate and evolve their immortal ebooks which will never go out of print. Indie authors enjoy the freedom to serve their fans as they want to serve them. Icing on the indie author's cake: Indie ebook authors earn royalty rates four to five times higher than they'd earn from traditional publishers. Readers don't care about the publisher name on the ebook's virtual spine -- The brand readers care about is the author brand. Indie authors are learning to build their own brands. They're learning to use FREE and deep-discounted books to build readership and brand faster than would be possible under the wing of a traditional publisher. There's a growing rift between writers and publishers -- Writers are angry. After centuries of living near the bottom rung of the publishing ladder, writers are feeling their oats and relishing their new-found independence. Writers are rejecting rejection. They know they no longer need to bow subservient to the whims of publishers. Writers are placing new demands upon publishers, asking for higher royalty rates on ebooks, faster sales reporting, faster payments, more transparency, more generous reversion clauses, more control over cover design and packaging, and more post-publication marketing support. Publishers are digging in their heels and labeling these demands as unrealistic. Writers are upset that several publishers have launched vanity publishing imprints powered by Author Solutions -- imprints that exploit uneducated writers by selling them overpriced publishing services. Writers view sins against their writerly brothers and sisters as sins against all authors. In total, these perceived publisher transgressions are undermining the goodwill and loyalty that writers once felt toward publishers. If publishers are unable to close the rift, the deal flow of new authors will diminish and existing authors will defect. There are some early signs publishers are beginning to feel the heat from self published authors, and it comes from Harlequin, the grand dame of romance publishing. In Harlequin's management discussion portion of its 2013 earnings announcement (released March 4, 2014), the company for the first time cited self publishing as a potential competitive risk: "The proliferation of less expensive, and free, self-published works could negatively impact Harlequin's revenues in the future." (hat tip Publishers Lunch). View the report here. 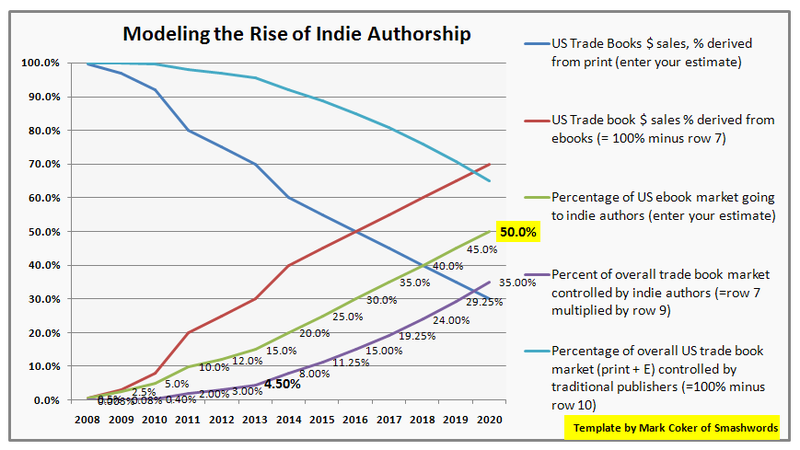 The 10 trends above underlie my prediction that indie ebook authors will capture at least 50 percent of the U.S. ebook market and over one third (35 percent) of the overall trade book market (print plus ebooks) in next seven years. Go ahead, call me crazy or delusional. I don't mind. For 2013, I estimate that indie ebooks accounted for 15 percent of U.S. ebook sales in 2013. Exact numbers are tough to come by because ebook retailers don't release complete figures, and publisher associations don't capture sales results from self-published authors. With print books accounting for approximately 70 percent of the trade book market in 2013 and ebooks accounting for the remaining 30 percent, it means indie authors accounted for about 4.5 percent (15 percent multiplied by 30 percent) of all trade book sales in 2013. In invite you to download my spreadsheet and modify my estimates and projections based on your own view of market trends. Click here to download the spreadsheet at Dropbox. Place your estimates in two rows: 1. In row 11, you'll estimate the percentage of trade book sales represented by print books (as you probably know, the term "trade book" refers to consumer books typically purchased through bookstores). 2. In row 13, you'll estimate the percentage of ebook market sales earned by indie ebook authors. The percentage of trade book market sales represented by ebooks. 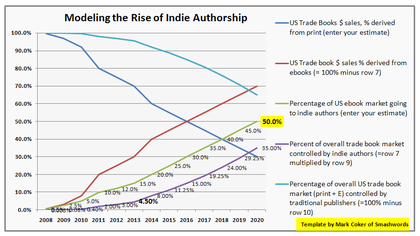 The percentage of the overall trade book market represented by indie authors. The percentage of the overall trade book market represented by traditional publishers. And then it will draw you a pretty chart. I encourage you to take a screen shot of your chart, post it to your blog or favorite social media site, and then explain in your post the reasoning behind your estimates. Do me a favor and include a link back to this blog post so others can play the pundrity game too, and please also post a link in the comments below so that others can visit your blog and benefit from your opinions and insights. Have fun! I look forward to reading your predictions.